Generalized joint hypermobility (GJH) has frequently been described as a risk factor for patellofemoral instability; however, only a few primary research studies have demonstrated any evidence of a relationship. The primary purpose of this study was to determine if isolated proximal soft tissue stabilization for patellofemoral instability is as successful in patients with GJH compared those without, as measured by disease-specific quality-of-life (QOL), symptom scores and functional outcomes. The secondary purpose was to determine if clinical and patient-reported outcomes were influenced by patient demographic factors in the presence of joint hypermobility. 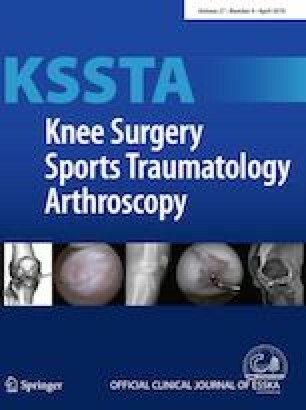 Between 2009 and 2014, data were collected on 174/193 knees (92% follow-up) following an isolated medial patellofemoral ligament reconstruction (MPFL-R). Patients with a Beighton score of 4 or greater were classified as positive for GJH, and any score of 3 or less was classified as negative. Pre- and post-operative Banff Patella Instability Instrument (BPII) scores were compared using a two-sample t test to determine the influence of GJH on QOL. The relationship between the Beighton score, and demographic and clinical factors was explored using correlational analysis. Functional testing including balance and single-leg hop testing was conducted 1 and 2 years post-operatively. Limb symmetry and mean limb-to-limb performance differences were calculated. In this cohort of isolated MPFL reconstructions, 55.1% had a positive Beighton score. There were seven surgical failures (3.6%). There was no evidence of a relationship between a positive Beighton score and pre-operative BPII scores, post-operative BPII scores or post-operative symptom scores. GJH did not correlate significantly with any post-operative functional testing measures. A positive Beighton score was inversely related to patient age and more prevalent in females. This study determined that the presence of GJH did not influence disease-specific quality of life, physical symptom score or functional outcomes following MPFL reconstruction. LH: Study design, Data analysis, Writing the paper, Paper submission and revision. SK: Study Design, Data analysis, Writing the paper, Paper submission and revision. NK: Study design, Data collection, Writing the paper. MRL: Study design, Data analysis, Writing the paper, Paper submission and revision. No external funding was received for this research project. This study received ethics approval from the University of Calgary Conjoint Health Research Ethics Board and Child Health Research Office (E-24393).